Swivel-lock electric fence insulators are one of the most important tools in your pasture management toolbox because they make it possible to create temporary cattle gates instantly, on demand, anywhere in your electric fence grid, saving you the hassle and cost of building hundreds of gates on your farm. With the flick of the tab on the swivel-lock insulator plus the help of a couple of notched PVC pipes, you can instantly move cattle across major pasture divisions or access water alleys from anywhere in your pasture rotation. Gates are the most time-consuming and expensive part of electric fence construction. If you have already read the article about the Smart Electric Fence Grid, you will know how important it is to create an electric fence installation that is flexible and simple. But that flexibility means you need cattle gates, and lots of them. Swivel-lock electric fence insulators make it completely effortless to create instant temporary gates anywhere in your electric fence grid. In this article I will teach you how to use swivel-lock electric fence insulators to create temporary cattle gates. This simple little tool will add another huge degree of flexibility to your electric fence installation while reducing your electric fence construction costs. What's so special about swivel-lock electric fence insulators? The electric fence insulator in the image below is a swivel-lock insulator. When the rotating tab on the insulator is swiveled to face down, the electric fence wire is locked in place against the post. 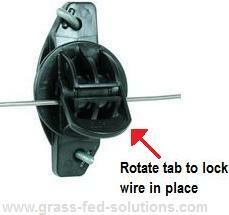 But when the tab is rotated facing up, the wire can be freely removed from the electric fence insulator. With rubber gloves, the tab can easily be opened even while the wire is 'hot', which allows you to easily detach the wire from the post to create a temporary cattle gate. Boundary fences, on the other hand, only need a few strategically-located permanent gates, so cheaper electric fence insulators that do not let you remove the wire from the insulator while the wire is under tension are sufficient for building your boundary fences. Furthermore, electric fence installations that use multiple wires (as is typical for boundary fences) are not suited to creating temporary cattle gates. Multiple wires cannot simply be bundled together to lift them up to create a temporary gate because of electrical shorts, which will frighten the cattle and prevent them from using the fence opening. Swivel-lock insulators, like this Powerlock Insulator by Gallagher Animal Management Systems, make it easy to create temporary gates simply by rotating the tab on the insulator, which frees the wire. The freed wire can then be lifted and propped up to create a temporary gate. Swivel-lock insulators are slightly more expensive than other insulators that also allow for wire removal while the wire is under tension. But cheaper alternatives are not worth the pennies you save. Swivel-lock electric fence insulators are constructed of better quality materials that are designed to allow you to easily and repeatedly re-open and re-close the rotating tab that locks the wire in place. And you can do this by hand while wearing rubber gloves to protect yourself from electric shock, without any other special tools. Some other electric fence insulators, such as the pin-lock insulators, are also designed to allow you to detach the wire from the post while the wire is under tension, but they are difficult to operate without using pliers because the materials do not slide easily past each other. Pin-lock insulators are also not designed for repeatedly detaching the wire. They become brittle from the sun and will soon break and need replacing. Swivel-lock insulators do not suffer from this design flaw, which makes them ideal for creating temporary gates as you need them in your pasture rotation. Their user-friendliness, their long-lifespan even when used repeatedly to create temporary gates, and the labour and electric fence construction supplies that you save by not building hundreds of gates in your pasture rotation makes swivel-lock insulators the obvious choice for your electric fence installation. Consider the example pasture rotation shown below. Imagine how many cattle gates you would need to build on both sides of the water alleys in order to divide this land into a daily pasture rotation if you use temporary fences to cross-fence the big electric fence corridors shown in the image. Every pasture slice needs access to the water alley. And when you reach the end of each electric fence corridor, you need gates to move your cattle to the next electric fence corridor. And since every pasture slice will be a different size depending on how fast the grass is growing and how much grass volume is produced, it's nearly impossible to decide in advance where you would need to build all the gates required to manage your rotational grazing program. Swivel-lock electric fence insulators and single-wire interior electric fencing allow you to instantly create all the temporary cattle gates you need to manage your daily rotational grazing program. 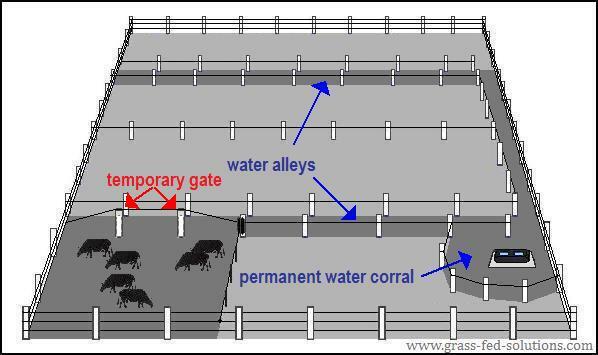 Click on the image to learn more about how to integrate your cattle water system into your electric fencing grid. To create a temporary gate so your cattle can access the water alley from their pasture rotation, simply open a couple of the swivel-lock insulators to free the wire from the posts. Then prop the wire up to create space for the cattle to walk under the wire. As I mentioned in Part I of the Smart Electric Fence Grid, the high-tensile 12.5 gauge wire used to build your permanent electric fences does NOT need to be stretched singing-tight. It's a psychological barrier - it merely needs to hang 32 to 36 inches from the ground. Thus, if you detach the wire from the electric fence insulators, it will have plenty of stretch to easily be lifted far overhead to create a temporary gate. With posts spread at an average spacing of 60 feet apart, your gate will be more than large enough to allow for easy cattle movement through the gate and ensures that the angle that the wire must be stretched won't be nearly as severe as in the example image shown below. The easiest way to prop up the wire to create the temporary gate is to use two PVC pipes, with two V-shaped notches cut into into the openings at one end of each pipe. Use the notches to lift and hold the wire. Lift the wire up and slip the pipe over the post to hold the post in place for as long as you want a temporary gate. This strategy allows you to create cattle gates anywhere you need them in your single-wire electric fences without having to build gates all over your farm. The plastic pipe acts as an insulator while it holds the wire. Use a notched PVC pipe to hold your wire when creating temporary gates in your cattle water alleys. Slide the PVC pipe over your fence posts to hold up the wire. The image above shows how to create temporary cattle gates in your single-wire electric fence lines. It's incredibly simple, thanks to swivel-lock electric fence insulators and a couple of 6 to 8 ft lengths of scrap PVC pipe with pipe diameters slightly larger than your thickest posts. The ease with which you can create these temporary gates is why I rank swivel-lock insulators among the most important electric fence supplies in your rotational grazing management toolbox. 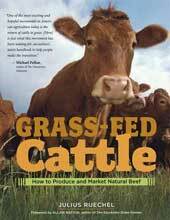 Livestock water - tips, tools, and planning advice for your cattle water system.